That’s right, Knoxville. You lost your alternative weekly, but you gained an evening of guffawery with myself, Jeff, and some festival-starting special guests who’ve done more for our fair city than any of the remaining newspapers (other than BLANK… they rule). Get there at 8 because we may start early this time. 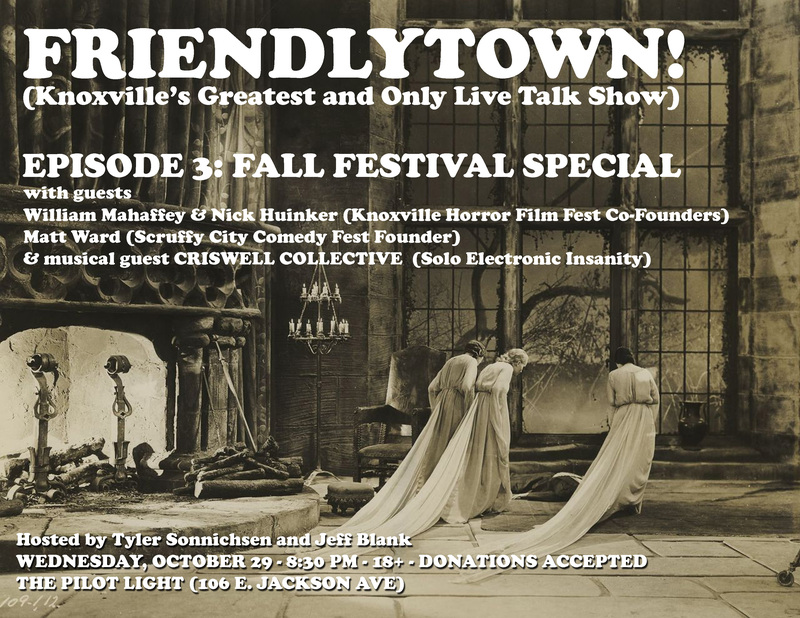 Don’t miss our special guests WILLIAM MAHAFFEY AND NICK HUINKER, the founders of the currently-happening Knoxville Horror Film Fest. If you’re around, go check out some great horror films (both funny and/or scary) tonight at West Town then the awards ceremony at Scruffy City Hall tomorrow night (Sunday). Concurrent with that, Knox Comedy is doing it’s annual Halloween show at Pres Pub. Whichever of those you go to, you’re making a better decision than the folks going to witness Last Comic Standing stuff the comedy-bubble into the Tennessee Theater that night. 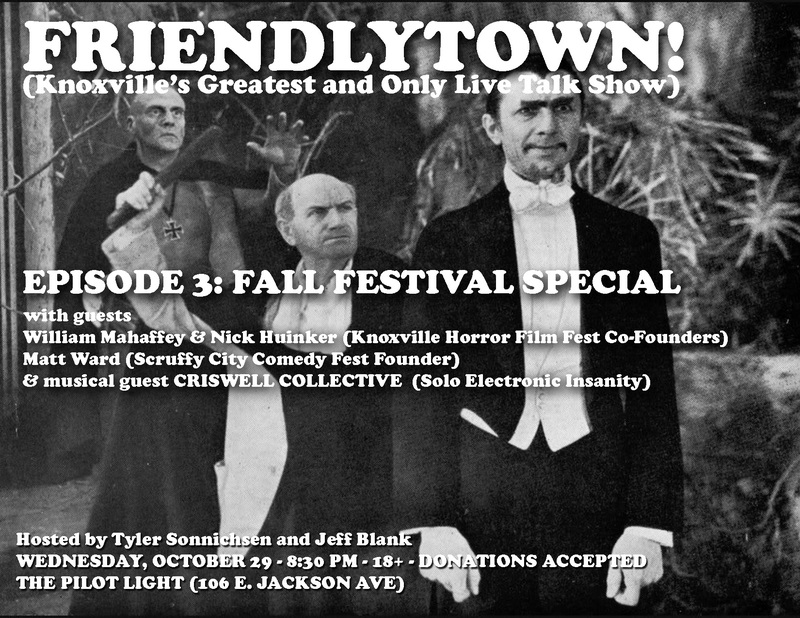 That being said, I’ll be out front of the TN Theater on Sunday night passing out flyers for the Scruffy City Comedy Festival with our other Friendlytown3 guest, MATT WARD. I can’t think of anyone I’ve known in comedy who’s worked harder at both making a functional life out of it while simultaneously skyrocketing a scene. So, come and hear about his life and maybe if you act nice, he’ll tell some jokes. And our musical guest on Wednesday is none other than CRISWELL COLLECTIVE. Some of you may know Brad from his being an all-around cool dude in tight red pants at the Pilot Light, or see him skating around Knoxville when his ankle’s not messed up. But that won’t keep him from putting on one of the most insane one-person shows you’re going to see this fall. Electronic madness not to be missed. On that note, what follows are the two most insane weeks, comedy and music-wise, for me in 2014. If I survive, then maybe I’ll vomit some words of wisdom and retrospective smarm onto this thing. If not, then it’s been a lot of fun knowing you all and thanks for supporting these things I’ve endeavored while in this mortal coil. Oh, and tune into Locals Only Radio this Tuesday night at 8pm on WUTK. Brad and I will be appearing on there to talk about all of this stuff I just wrote about here. If it’s anything like last week’s show, there may just be discussion of mid-90’s Nicholas Cage movies and we’ll have prizes to give away. But seriously, tune in- 90.3 FM around the Knox or on the internet anywhere in the world. You’re all great. Here’s an alternate flyer for Wednesday’s Friendlytown show. Tags: blank newspaper, criswell collective, friendlytown, knox comedy, knoxville, knoxville horror film fest, locals only radio, metro pulse, pilot light, scruffy city comedy festival, WUTK. Bookmark the permalink.